Successful Irvine Permanent Teeth in 1 Day Seminar held by Cunning Dental on 6/2/18. Orange County residents learning about Teeth in 1 Day in a group environment. Attendees met actual Teeth in 1 Day patients who had this life changing procedure. One of the nice things about getting the Teeth in 1 Day procedure is that you literally do not need any more traditional dental work. Since they remove your broken, cracked or infected teeth and replace them with a new arch of teeth that are fixed to 4 dental implants you never have to worry about another root canal, dental bridge, or dental crown ever again! If there is every any issue with the new of teeth the Permanent Teeth in 1 Day Dental Team at Cunning Dental can remove them, fix it and re-attach. It’s recommended that patients use a water pick if they need to clean around the new teeth but that’s about it! Schedule a dental exam today! Find out if you are a candidate for the Permanent Teeth in 1 Day procedure today by calling (855) 328-6646 or schedule an exam online. Dr. Cunning said a few words about the history of Cunning Dental Group at the seminar. Patients that are hearing the radio ads, tv ads or internet ads are thrilled that they get to meet the man that started the business almost 50 years ago. He takes the opportunity to go around the room and shake hands and meet everyone before he starts his speech. Not only that but he gets a chance to introduce his longest team member, Janet, who has been helping his Inland Empire cosmetic dentistry practice for over 44 years. Wow, that’s pretty impressive. This seminar featured three actual patient testimonials (Steve, Doreen & Monica). 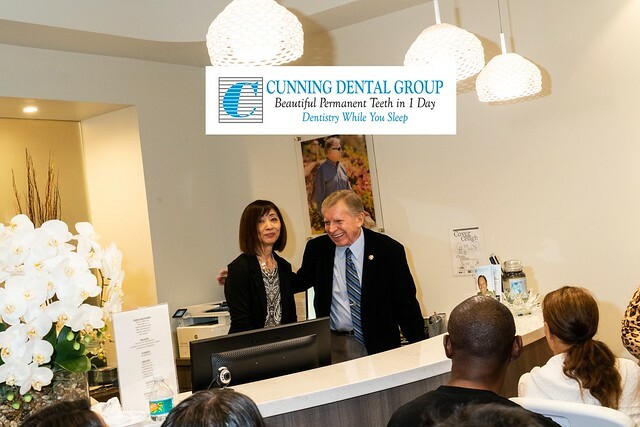 Patients were thrilled to see Steve & Monica live at the seminar since they are featured on the Cunning Dental tv commercial for Permanent Teeth in 1 Day. Seeing is believing so patients got a close up view of their beautiful, new fixed teeth. If you have questions or just want to learn more about the Permanent Teeth in 1 Day procedure then please consider attending a future seminar. What’s my next step to fixing my teeth? In order to find out if you are a candidate for Teeth in 1 Day then you will need to schedule an exam, X-Rays & 3D CT Scan. At that point we can review the results and discuss the best long term dental treatment options for you. Please call us at (855) 328-6646 or schedule an exam online.